The chlorine-containing substances (chloroflourocarbons or CFCs) that destroy ozone were included in many sprays (deodorants, fly spray etc) and refrigeration units. After the usual arguing among environmentalists, scientists, governments and others who thought it was a beat-up, the world got together and delivered an international treaty. The treaty, known as the Montreal Protocol, regulates use of CFCs. 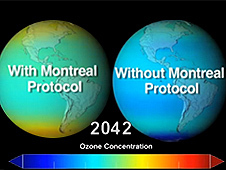 In the 1980s, the projections of ozone depletion from the atmosphere were dire but the Montreal Protocol appears to have at least reversed the trend (see figure below). NASA says that the ozone hole will not shrink to the size that it was in the early 1980s until 2065. On the NASA website, scientist Paul Newman of NASA’s Goddard Space Flight Center says that natural fluctuations in weather patterns resulted in warmer stratospheric temperatures in 2012 and that this made the ozone hole smaller. Diplomatic work continues to eliminate the use of CFCs entirely but the United Nations continues to report on the monitoring of the black market for these substances. It would be nice to think this is an environmental success story, but it seems there is still some way to go. At a minimum, the ozone hole story is a case study in what governments around the world can do when they really try. 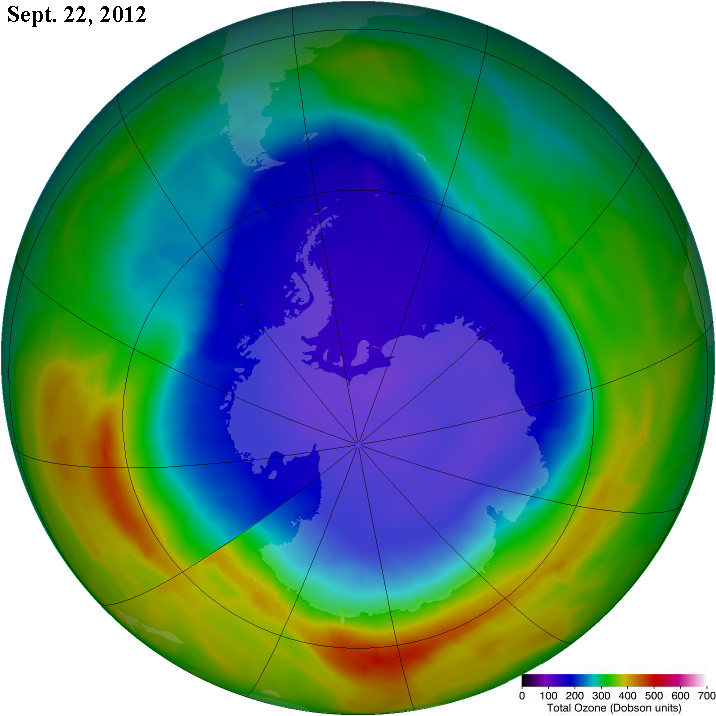 As a kid in the 80s, the ozone hole issue loomed large. a thought: how did the CFC industry campaign compare to fossil fuel industry’s sophisticated anti-global warming PR machine…?